"Sampath Speaking" - the thoughts of an Insurer from Thiruvallikkeni: statue of Mikhail Timofeyevich Kalashnikov had to be tampered ... for it shows !!!! 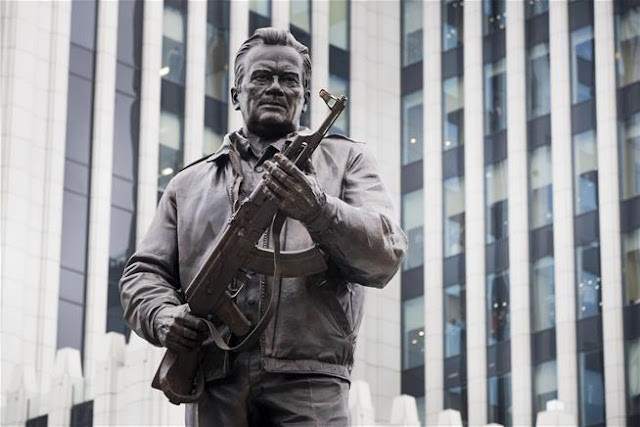 statue of Mikhail Timofeyevich Kalashnikov had to be tampered ... for it shows !!!! In most parts of Tamil Nadu, you can find statues; more so on Marina beach in Capital Chennai … elsewhere, the monument in the heart of Moscow was supposed to be a tribute to the creator of ____________ but, things went wrong, spectacularly so !! 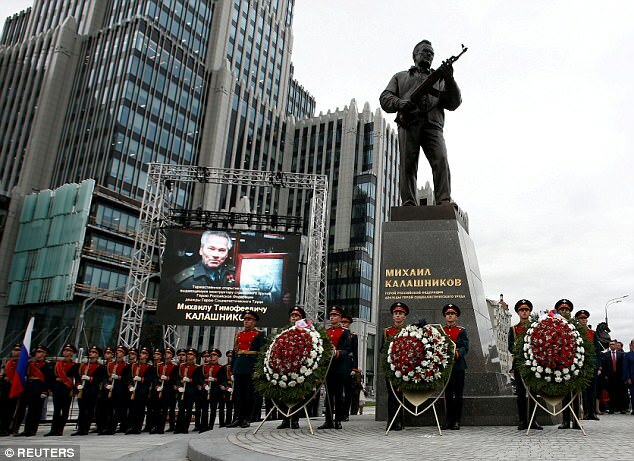 It is all about the statue of Mikhail Kalashnikov, the inventor of the AK-47 assault rifle, that was unveiled in central Moscow in a controversial ceremony that merged military pomp with religious ritual. The nine-metre (30ft) monument depicts Kalashnikov clutching his eponymous automatic weapon. The unveiling ceremony was attended by high-ranking Russian officials including Vladimir Medinsky, the culture minister, and Petr Biryukov, Moscow’s deputy mayor. “This is Russia’s cultural brand,” said Medinsky, before a Russian Orthodox priest blessed the statue. “He created this weapon to defend his motherland,” said another, shrugging off suggestions that it was inappropriate to sprinkle holy water on a statue of a weapons designer. A guard of honour from the Russian defence ministry stood to attention throughout the ceremony, which also featured second world war-era military songs. The last century was different – there was cold war and there was great market for those supplying arms. Civilians perhaps can never understand the complexity; internal troubles were freely brewed in every other country by those countries who traded in arms and wanted others to buy theirs to ensure a steady market - it was chaotic and restless in many parts of the World. Those active in the supply market included Soviet Union, People's Republic of China, and of course USA. The arms and ammunitions used by those countries depended on which side they relied upon. There were names such M14, FN FAL, H&K G3, M 16 and more and then there was the more famous AK 47 – made famous by Cinema, Press and all media, highlighting usage of this weapon by global terrorist groups. This assault rifle was famous because of its low cost, that it could be duplicated or used as basis for many other rifles. A terrorist holding AK 47 was the photo most often flashed in many a media. It is stated that during WW II, Germans pioneered the assault rifle concept, based upon research that showed that most firefights happen at close range; the power and range of contemporary rifle cartridges was excessive for most small arms firefights. Then came AK 47 into market. Lieutenant General Mikhail Timofeyevich Kalashnikov designed this weaponry as also AKM and AK 74. AK 47 the assault rifle was named after its inventor. It was a selective-fire, gas-operated 7.62×39mm assault rifle, officially known as Avtomat Kalashnikova. Its design work reportedly began in 1945, next year it was presented for official military trials and in 1947 the fixed stock version was introduced into service. 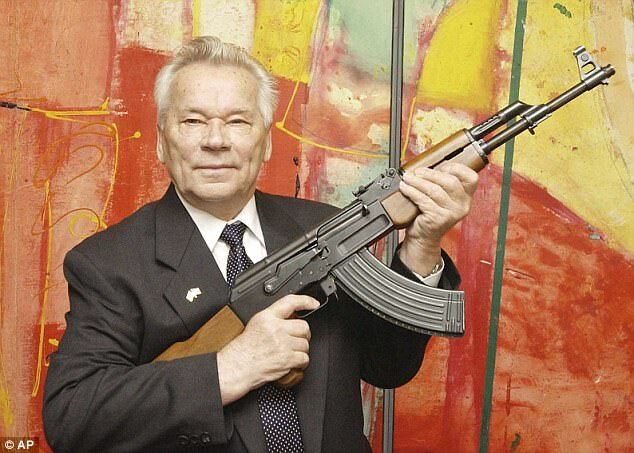 Mikhail Kalashnikov began his career as a weapon designer while in a hospital after he was shot in the shoulder during the Battle of Bryansk. A particular requirement of the competition was the reliability of the firearm in the muddy, wet, and frozen conditions of the Soviet front line. Now more news flowing after the unveiling about the statue built to honour the inventor of AK47 !! MailOnline, Guardian and other Press report that workers had to cut out part of the new monument to Mikhail Kalashnikov, the inventor of the Soviet Union's legendary assault rifle, after eagle-eyed Russians noticed it mistakenly depicted a Nazi weapon from the Second World War. Just last week, the monument - which reportedly cost £450,000 - was unveiled with much fanfare in central Moscow. Soon after Moscow-based historian Yuri Pasholok blasted Shcherbakov for the statue, pointing out in a Facebook post that it featured a German StG 44 assault rifle instead of the legendary AK47 made by him. His critics point out that this is not the first time the sculptor has put a German gun on a Russian statue. In 2014, a Mauser 98 rifle appeared on a monument he designed showing a Soviet soldier heading to fight the Nazis. So the base was drilled to remove German StG 44 had been depicted in the bas-relief and place the intended – ‘AK-47’, the small-arms mainstay of Russia's armed forces for over 60 years, hailed by experts as the most effective weapon ever made. Experts add that Mikhail Kalashnikov's weapon created in 1947, does have a striking resemblance to German arms designer Hugo Schmeissers's StG 44 rifle, created in 1942, although they have major design differences ! ~ it adds spice as there has been some speculation that AK47 had copied the German rifle ! Vladislav Kononov, executive director of the Russian Military and Historical Society, was cited by Russian media as saying that the fact that angry Russians had spotted the error in the relief disproved that. Many had earlier vented their disapproval on social media. Every fifth firearm in the world is a Kalashnikov, with more than 70 million of the assault rifles produced over the past 60 years, the Kalashnikov Concern manufacturer said on its website. Kalashnikovs are in service in 50 foreign armies, it added. If you are fascinated by Kalashnikov, don’t worry. You can still perhaps buy one though may not be available in Indian market. You need not be one fascinated by arms to buy this – for in 2003, Mikhail Kalahsnikov lent his name to German Company MMI based in Solingen, West Germany – a company that specializes in umbrellas. Thus Kalashnikov brand umbrellas as also vodka cocktail, tennis rackets are perhaps available in European market. It was also reported quoting the Russian inventor himself that he made no money from his AK 47, though millions were sold and that this endorsement was a plan to supplement his paltry pension……..